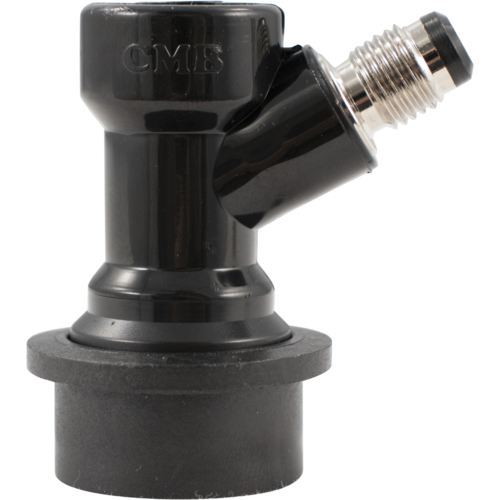 This black, beverage out quick disconnect comes with a flare for attaching to a beverage line, and it's made by CM Becker so you know it is high quality. The flare threads measure 1/4 inch. Just bought 3 new ball lock kegs, and these will fit them nicely! Are the connectors the same on ball lock Corney Kegs and ball lock Torpedo Kegs? BEST ANSWER: The connectors function exactly the same. The internal construction of the posts is slightly different, so replacement parts wouldn't be interchangeable. Yes, they fit all ball lock kegs. Cheers. Which fitting would be needed to attach 3/8 ID silicone tubing? I'm sold on the flare fitting connectors.. Now I don't need to cut the tubing any longer. I like these as they are "Changable" without clipping your line. They are user parts that I have had to replace over time and the 1/4 fitting makes that easy. Many quick disconnects are poorly cast and assembled-- not this one! Great connector. I've been popping these off and on kegs for a couple of years now. Still going strong. I was initially concerned they were plastic, but they're in great shape. Recommended. A must have if you're an owner of a ball lock corny keg. I use a half a dozen of these on a daily basis. They work great, very easy to disassemble, clean, and sanitize. Use these if you can! I like these fitting much better than the barb version. Easier to clean up and use IMO. I only had those with barbs. This on the other hand is much better to use, just have all the hoses ready with the appropriate 1/4" flare fitting and it becomes much easier to prepare the setup. This connector has held up well for 2 years, so I can recommend it. These make it easy to clean your tubing. They are a little more $ but wothr it. These are great; they clean easily, seal well, and can be used for transferring anything and everything to and from your kegs. Definitely recommend this over the barbed one. You can disconnect this from the hose for easier cleaning or to make some strange configurations as those needed with a plate filter. I've bought 5 of them just in case. I have been using since I started kegging (3 months ago) and haven't had any problems yet. I've found these are a lot easier to use than the barbed disconnects. They snap in to place on the keg great. Definitely recommend. Quick disconnects are the way to go! Especially the flare style. I stil use the little white washer and tighten it down with a 9/16 wrench to prevent any leaks. Great for "closed" transfers from carboy to keg. Flare allows for multipurpose hose configurations such as keg to keg transfer line or keg washer. I recomend this product over the barbed one... Just seems safer to me. High quality product. I even got a few more, just in case. These are high quality disconnects, never have had an issue. It's very nice to be able to remove it for sanitization, which allows the use of oetiker clamps to keep the hoses permanently clamped. This Beverage Out Flair is one Stylin', profilin', limousine riding, jet flying, kiss-stealing, wheelin' n' dealin' son of a gun! Seriously, way better than the barb option. I can move it around from my keg cleaner to my kegerator to my jockey box with the greatest of ease. The only thing that would make it better is if it was made out of stainless steel. My lagers, my stouts ... my beers. You snap on so securely and neat. And through MoreBeer you came oh so cheap. And you refused to connect and ruin my regulator on a whim! A different product I would never Choose! Definitely recommend this over a barbed QD. You can disconnect this from the hose for easier cleaning.